Welcome to Riddhi Siddhi Packers Movers Pvt. Ltd. Welcome to Riddhi Siddhi Packers and Movers in Jaipur, Rajasthan, India for all your relocation and moving requirements. Riddhi Siddhi expertise in relocation and moving industries specially for domestic and commercial requirements. Riddhi Siddhi spread our branches in all over rajasthan and cover all industrial and cement plant areas. If you are looking for best packers and movers and searches for best and trusted packers and movers in jaipur then your search ends right here. It doesn’t matter what kinds of goods and items you want to move or relocate towards anywhere in the state or city, Riddhi Siddhi have the best solutions for you and this comes from our experience of years which we earned by working in the industry since last twleve years. Riddhi Siddhi Packers and Movers jaipur provides different kinds of tailor made services as per your requirements like Packing-Moving, Shifting, Loading-Unloading, Warehousing and Car Transportation. We are leading Movers and Packers in jaipur in all over India and having branches all over the country to serve you anywhere according to your requirements of moving and shifting. Riddhi Siddhi Packers Movers Jaipur, Packers Movers Jodhpur , Packers Movers Bikaner, Packers Movers Udaipur, Packers Movers Alwar and all over rajasthan rendering any kind of packers and movers services and provide entire solutions without troubling your regular schedule. 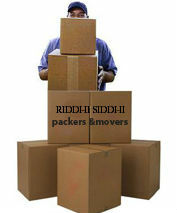 Riddhi Siddhi Packers offer comprehensive and affordable packing and moving services. All the essential elements of packing and moving services are discussed with the customers in detail during our preliminary planning and consequently we are able to provide comfortable and on-time relocation. As Satisfaction is the main thing that you will be surely getting through our services that's why our packers and movers services in jaipur are maintained by a team of skilled professionals who have a vested interest in providing complete satisfaction to customers or clients. Ability to meet all the packaging and moving needs. All India packaging and moving services available here. All types of shifting services. Home Relocation and office Relocation. Riddhi Siddhi Packers Movers Pvt. Ltd. Designed and Developed by Tulipshree Infotech Pvt. Ltd.